Just because not everyone celebrates Christmas doesn't mean Christmas can't come to everybody. Even the NPCs in Skyrim. 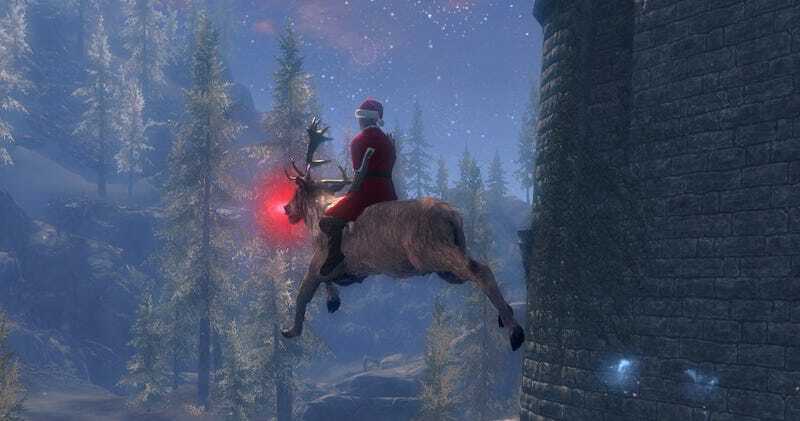 PC Gamer decided to create a new character in the game, dress them up as Santa and try and deliver presents to every NPC in the game in a single night. Using a variety of mods, from a Rudolph-themed flying mount to a spell that automatically unlocks doors, Krys Krynn-Gul is going to spend 12 hours bringing hope and cheer to some clockwork people who seem to be in short supply of both. Since his journey is just beginning, you can follow his perilous journey here.